G Data TotalProtection 2014 – anti-virus protection with hybrid technology G Data CloseGap. Additional features: security settings, backup, secure online banking and device management. 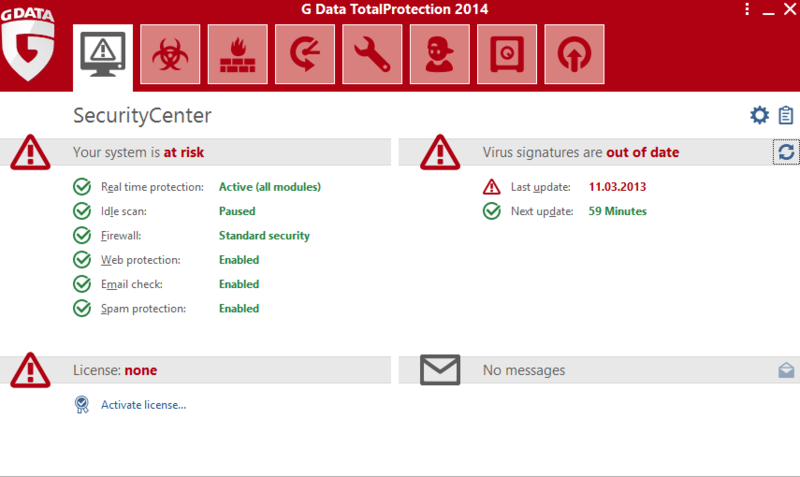 G Data TotalProtection 2014 is a new complex solution for comprehensive protection. Integrated technology CloseGap offers reliable protection against all types of malware and Internet threats. Active Hybrid protection blocks specific threat and does not slow down your computer, effectively combining proactive, cloud and signature detection methods. Backup and secure storage to protect sensitive data from loss or theft. Device Control allows you to control your connected external storage media. Web protection, parental controls and plug-in for web browsers G Data BankGuard allow for a safe trip to websites, restrict access to undesirable Internet, to protect financial transactions using online banking and online shopping. – Less resource through optimal use of security technologies. – Secure web site visits and secure online shopping on the Internet. – Blocking of annoying advertising. The new technology is already integrated G Data G Data TotalProtection in 2014 and allows for a more effective and timely protect your computer from malicious software.